Jaaron Simmons – PG All Ohio: Athletic playmaker was a good decision maker all weekend in helping lead AOR to the championship game. Simmons is explosively quick off the dribble with his first step while also showing excellent top speed in transition. Emerging shooter who is equally skilled as a passer or a scorer. Nigel Hayes – PF All Ohio: Versatile offensive threat with great athleticism Hayes was the number one key to Red making it to the title game. He stepped out and hit several long jumpshots with good form and handled the ball on the wing better then we’ve seen him do so in the past as well. Hayes recently announced that he will not be playing football next year, to focus on his basketball skill-set. Tony Farmer – SF All Ohio: The 6’7 wing played strictly on the perimeter all weekend, and even spent some time running the point. Farmer shot the ball decently but was more impressive as a passer and scorer at the rim. He still has all the power and athleticism of an elite prospect who is absolutely dominant when his motor is running high. Zach Garber – C All Ohio: Garber did a nice job of controlling the mid and low post offensively by establishing good position for himself early in possessions. He showed strength, toughness, and nice touch inside as a finisher as well. Garbed didn’t show off a bunch of post moves but was an efficient scorer by overpowering smaller opponents and getting some second chance points; as well as shooting it with consistency out to 15 feet. Maurice O’Field – SF All Ohio: Breathtaking athlete threw down a few highlight dunks but was more impressive with his improved offensive IQ. O’Field hits hits mid-range spots when they come to him and is very good at straight line drives to the rim off the bounce. He is learning to play within a five man offense to find opportunities to score and his athleticism only helps in that area. Deontae Cole – SF/PF Ohio Phenoms: Probably Ohio’s best pure set-shooter, Cole doesn’t miss many when he has his feet set on the catch and shoot. He had multiple games of over 4 three’s over the weekend and is shooting with repetition and confidence from deep. Cole also did a nice job as a defender on the wing and in sometimes on the block. Tony Kynard– PG Ohio Phenoms: One of the shiftiest guards on the circuit Kynard is lightning quick and a really good ballhandler. He is a skilled scorer and a very good passer with vision that is great in transition. He needs to value every possession with the ball but he is an underrated and high level talent for Division I coaches to look at. Monty Boykins – SG Ohio Phenoms: Boykins played with the most passion that we’ve ever seen him display and the results were beyond positive. He scored nearly at will over the weekend by aggressively attacking the rim to draw fouls, knocking down his signature three pointer, and playing with pace in transition. Still continuing to develop as a defender but has a high major ceiling with all that he brings to the table offensively. Vitto Brown – PF Ohio Phenoms: Brown did more then just block shots over the weekend as he controlled the paint both days en route to huge numbers as a scorer, defender, and rebounder. Much improved offensive force that can score in the paint, shoot the 17 footer with regularity, and shake defenders off of the bounce. 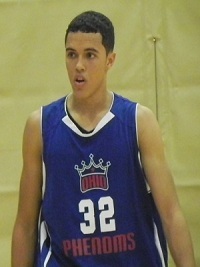 Brown is a terrific athlete who has as much potential as any big man in Ohio. Nick Fredrick – SG Ohio Phenoms: Always known as a shooter Fredrick had a breakout weekend as a penetrator who is learning how to be crafty attacking the basket. Solid ballhandler who can really shake defenders off the bounce when he’s playing with confidence. With his quick release on his jumper he has the potential to be a really deadly mid-range scorer. Kevin Johnson– PG OBC: Now that he’s a very good shot-maker “KJ” has grabbed the reigns of Ohio’s top guard in 2013, and is starting to run away from the pack. Capable of creating a shot whenever he wants Johnson has great first step speed, can play off the jab, and is improving in the pick and roll game. The sky is the limit for his development as a player as he continues to hone his understanding of the offensive end. Josh Davenport – SG/SF OBC: When Davenport is playing aggressively on the wing he is very difficult to contain, thus was the case on Saturday as he slashed his way to big scoring numbers. Davenport is a very good athlete with a sneaky explode dribble to get by his man and some shift in changing gears or direction. Still needs to develop as a jumpshooter but he is Ohio’s most talented shooting guard. 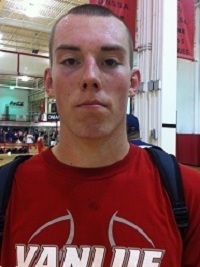 Tyler Ptacek – SG OBC: If Cole is Ohio’s best shooter off the catch then Ptacek is by far the best in transition. As soon as he gets across halfcourt he’s looking to set his feet to let one go and his confidence has grown one hundred fold in a year. Very underrated athlete who is getting better of the bounce and has attracted a trio of Divison I offers. Jae’sean Tate – SF/PF All Ohio: Game-changing athlete with toughness that is continuing to improve his skill set and offensive IQ. Versatile player that right now is near impossible to match up with as he plays with effort, athleticism, length, and can dominate you with power. Tate has emerged this spring as a player that is being recruited heavily at the mid-high major level. Kendrick Mallory – PG/SG All Ohio: Elusive and skilled combo guard that is probably best suited as a point man with the ball in his hands. Mallory is a smooth scorer from 15 feet, can pass the ball, and is explosive in scoring at the rim off a dribble. Need to see more of him but he’s definitely one of Ohio’s top young guards. Eric James – SF All Ohio: Creative guard that is best as a wing scorer shooting the long ball or attacking the rim. Really like James passion for the game and effort on the floor, as he continues to develop that should pay huge dividends. Good athlete with bounce and nice size for a sophomore wing player. Ben Harraway – PG Ohio Phenoms: Underrated point guard in Ohio that can handle the ball without making many mistakes, while also being a very good on-ball defender. Harraway doesn’t wow you with anything he does but makes winning plays for his team. Blake Simpson – PF/C Ohio Phenoms: Simpson really played well over the weekend by giving maximum effort as a rebounder, scorer, and defender in the paint. He’s still learning the finer points of offensive scoring from the low block but with the way he rebounds offensively it’s easy for him to get his points. Great athlete that can get way above the rim to block shots or finish dunks Simpson is raw but full of potential. Dahmere Epperson – SG/SF Shining Stars: Strong and athletic wing that can play any perimeter position Epperson doesn’t do anything great but impacts the game. Very good playmaker off the dribble we like his intensity and he should develop into one of the best sophomores in the Cincinnati area by next season. 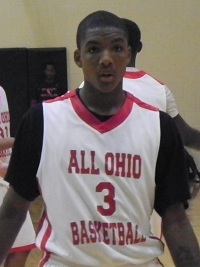 Esa Ahmad – PF All Ohio: Skilled, athletic, and versatile scorer capable of playing SF, PF, or C. Ahmad is one of Ohio’s top talents in 2015, and could contend for the top spot. He’s still a little raw but at 6’6 with his athleticism and a strong frame that should expand he’s an intriguing talent that high majors will recruit. We like his shooting ability from 15 feet and his consistent finishing and he should develop some moves off the dribble in time. VJ King – SG All Ohio: King recently moved from North Carolina to Akron (where he will attend St. Vincent-St. Mary’s) and is only in the 8th grade, despite playing up at the 15u level. Ranked as one of the country’s elite players it’s easy to see why as he’s an athletic and smooth wing that can flat out make plays offensively. Capable of running the point at 6’5 he can shoot it, pass, score off the dribble, and possesses a natural feel for the offensive end of the court. We’re very excited to watch him progress over the next four years. Mike Simon – PF All Ohio: In our first viewing of the big man from Hilliard Davidson we came away impressed with his size, frame, strength, and touch around the rim. Simon is pretty skilled for a young big man and while he’ll have to get a little quicker he has good potential as a versatile scorer who can take up space and rebound defensively.